Reading that Sotheby’s are to sell a wonderful private cookery library on 15 July reminded me of the time I interviewed the brilliant Swiss chef Anton Mossiman (below) at his plush Belgravia restaurant. I wanted to know more about his huge collection of cookery books and had asked him to bring to the interview some of his favourite volumes. I was not prepared for the treasures that he lay before me on the table. These included an edition dated 1507 of Der Kuchenmeister, the earliest cookery book ever printed, which was partly in Latin, partly in German.. He also showed me a first edition dated 1570 of one of the most attractive cookery books ever published--- the work of Bartolomeo Scappi, chef to Pope Pius V, which contains fascinating plates of cooking utensils. In all, Mosimann’s gastronomic library came to around 6,000 volumes, most of which he has placed at the service of the students on his training centre in Battersea. 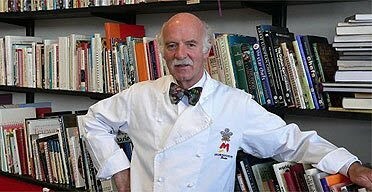 Mosimann had been a dedicated collector since his training on the continent—where he had picked up early texts for a few francs--hence the European slant to his collection, and I suspect that the continent is still the place to look for very early cookery and medical texts. However, even on the continent, treasures like Scappi and Der Kuchenmeister are rarely to be found outside libraries, and in the unlikely event of copies turning up for sale, would fetch five figure sums. Most 16th century and seventeenth century cookery books in English are also expensive, with Robert May’s The Accomplisht Cook (1660), which won praise from Elizabeth David and Frances Bissel, making more that £4,000 at auction a few years ago. Doubtless the demand from well heeled celebrity chefs has pushed up prices. For a collector with a more modest pocket the place to start is the early eighteenth century-- a time of peace and plenty when a burgeoning middle class loved to stage elaborate dinner parties. But generally you should forget manuscript books of recipes. Mosimann found original material in them, but many recipes were copied from printed books and most manuscripts are dominated by home remedies for the bite of a dog or the bloody flux. It’s all a bit folk-lorist . I’ve looked at a lot of these cookery manuscripts and most are no better than that most boring of documents, the common-place book of some bored cleric or unmarried daughter of a Georgian landowner. Instead look out for the big names of the Georgian and Victorian period—Hannah Glasse, Sarah Harrison, Eliza Smith , Mrs Rundell, Eliza Acton, William Kitchener, Francatelli, Mrs Beeton. To Mosimann and many others Hannah Glasse is a classic. 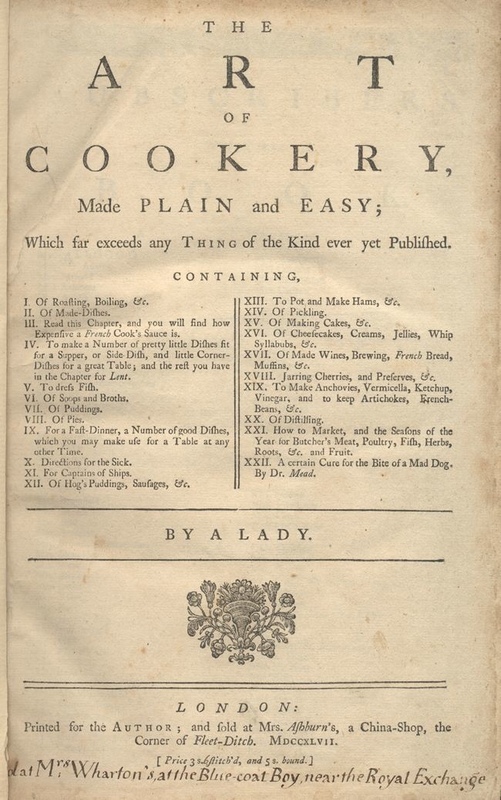 Fifty editions of her Art of Cookery Made Plain and Easy (1746) were published in the 18th century alone and early editions are always pricey at £700 upwards. And although Glasse’s predecessor, Eliza Smith, bulks up her Compleat Housewife (1739) with 190 pages of home remedies and suchlike, a first will still set you back around £600, while the Kegan Paul reprint of 2005 is listed on the Net at a dyspeptic $200. Another early Georgian, Sarah Harrison, is worth seeking out for her tips on preserves and sauces. I was lucky enough to be given my copy of the sixth edition (1755) by a friend, but much as I appreciate the gift I cannot understand why Dombey & Son are charging £1,040 for a book of such modest length. 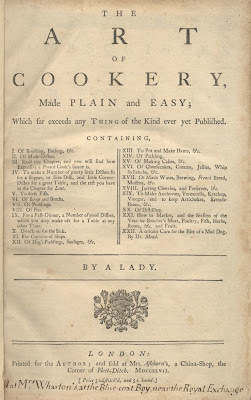 Mrs Rundell, a much more voluminous writer, whose Modern Domestic Cookery by a ‘Lady’ (1806) reached 65 editions in 35 years, isn’t anything like expensive. I bought my early Victorian edition for just £3.50 in the nineties, and at present Roe and Moore have a second edition for a piffling £28. Meanwhile here is a recipe for a Yorkshire Pudding from The Art of Cookery made Plain and Easy, by Hannah Glasse, 1747. Serious calories. It is from the excellent Jane Austen Centre site and even has a video demonstration of how to make this gastronomic delight. "the exclusive Chelsea bookshop Sandoes"
Hardly exclusive. They've let me in.